Our March cruise from Miami included stops at Cozumel island and at nearby Costa Maya on the Yucatan mainland. For both stops I had prearranged assistance from local birding guides, who turned up trumps in both cases (unlike a later stop in Costa Rica). As we had visited both places in the past my wife pre-agreed not to opt for alternatives to birding, such as visiting Mayan ruins and sampling the product at a tequila distillery ranch again. With reportedly 577 bird species on the current list (6 near-threatened) including 11 endemics on the mainland and a further 3 on Cozumel, the opportunity beckoned to see more than a few lifers! The Yucatan peninsular is at southern edge of Mexico, bordering on Belize and Guatemala. It sticks into the sea towards Cuba and helps define the Gulf of Mexico from the Caribbean Sea. On the coast there is a thriving tourist industry, but the boundaries between northern Guatemala, Mexico and western Belize are still occupied by the largest continuous tracts of tropical rainforest in Central America (though these suffer extensive deforestation). In the jungles there are many impressive Maya archaeological sites throughout the peninsula, two of the better-known being Chichen Itza in the centre and Tulum on the coast. But the area has a rich wildlife too, including jaguars (we saw an agouti and a raccoon on our short visit). Our guide reported that he had seen a jaguar recently and that they were a problem for the local dogs, though no danger to humans as yet. Cozumel is the largest Mexican island in the Caribbean, 12 miles from the Yucatan mainland, but still relatively small (30 x 10 miles). Even flatter than Grand Cayman, the highest point is 49 feet above sea level. Much of the interior is mangrove forest. Because of its separation from the mainland there are a number of small endemic creatures, including endemic bird species. Both locations have a substratum of limestone, having been raised from the seabed by the meteor collision that killed the dinosaurs. As a consequence there are over 6000 sinkholes (called cenotes) where fresh water overlies the otherwise saline water. These cenotes and associated underground caverns, etc., are a magnet for cavers and potholders, as well as having been a pillar of the once thriving Mayan civilisation. 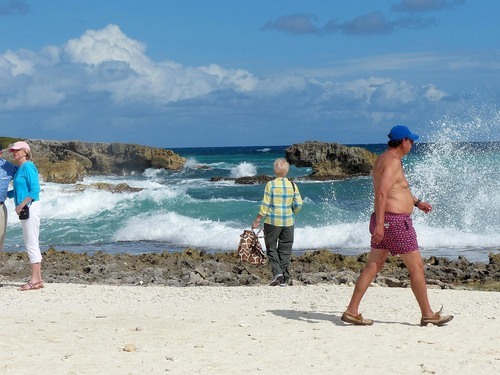 To give a flavour of the spectacular coastal scenery of Cozumel, here is a shot taken from our earlier visit. 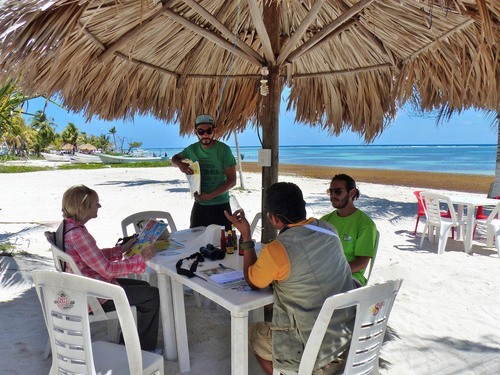 And here is a shot of our lunching on the beach in Mahahual (near Costa Maya cruise ship port) with our birding guides, Victor and Lucas. Here we all sampled an excellent Mexican Ceviche – a mixture of cold seafood and salad. Despite the obvious attraction of the place, note the twenty yard band of floating seaweed all along this coast, which would put me off having a dip! That said, the seaweed is ideal for waders. 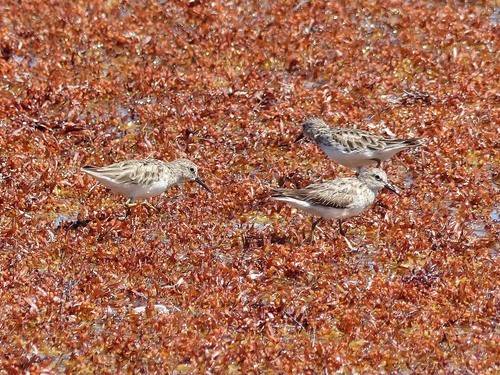 Here is a close-up of a group of Least Sandpipers doing their number. Walking along the beach we also saw a group of Turnstones, some Semi-palmated Sandpipers, a single stationary Black-bellied Plover (aka Grey Plover) and a Greater Yellowlegs actively feeding in the water’s edge. 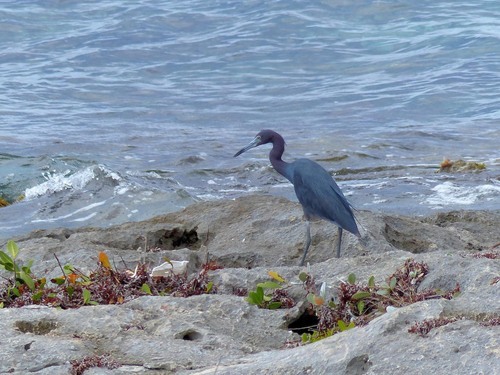 Further along the coast we could see a pretty Little Blue Heron from our table. It was busy foraging despite a number of people and boats nearby. Here is a similar shot of the bird which I took a day earlier on Cozumel. The coast around Mahahual was a mixture of homes, waste ground, sparse trees and scrub. There we saw a group of 4 Yucatan Jays squabbling, a Yellow-billed Cacique foraging on the ground, a Squirrel Cuckoo that flew direct into the middle of a bush - and many Orioles. 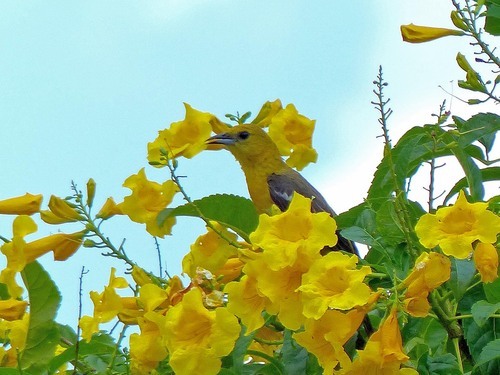 Apart from the odd Baltimore and Long-tailed Oriole, those were mainly Hooded Orioles. Orioles were very difficult for me to catch on camera in the open. 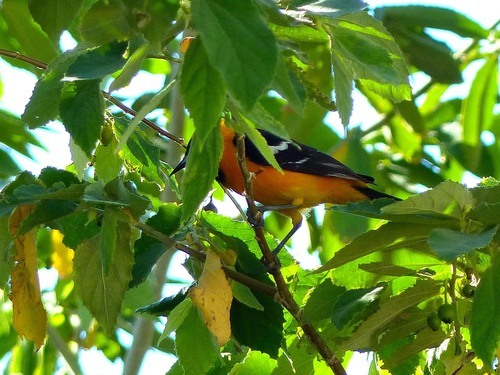 Here is a partial shot of the male Hooded Oriole showing its orangey breeding plumage and black bib. And here is also a partial shot of the more dowdy female feeding on nectar in Cozumel the day before. 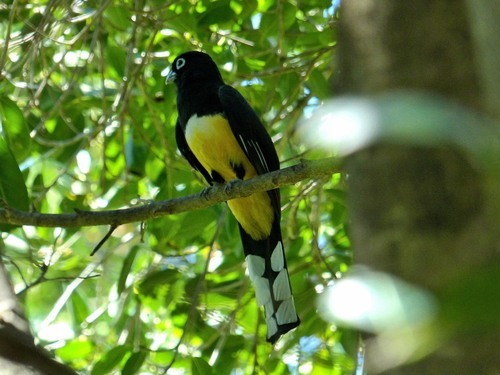 But Victor, our guide, heard what he said, from the clucking calls, was a Trogon. When we finally tracked it down, it turned out to be this beautiful male Black-headed Trogon, which patiently sat in the tree while I got the focussing right. I read that Trogons customarily nest in cavities excavated in the large black ball nests constructed in trees by, and occupied by, termites. I suppose there are advantages for both sets of neighbours but I wouldn’t want to be a nestling! Another highlight on the coast was this spectacular Lineated Woodpecker, which Victor found for us at the top of a dead tree trunk. The brilliant red crest is apparently raised and lowered as part of threat behaviour, not that we onlookers were a cause for concern! 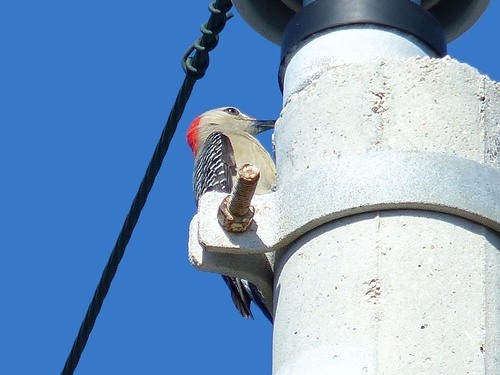 This large woodpecker is mainly an insectivore but, like our Greater-Spotted species, it sometimes takes seeds and fruit. Just outside the cruise ship port was also a productive area for birds. Here we spotted Blue-gray Gnatcatchers, White-collared Seedeaters, a fine male Rose-breasted Grosbeak and a pair of Tropical Kingbirds. 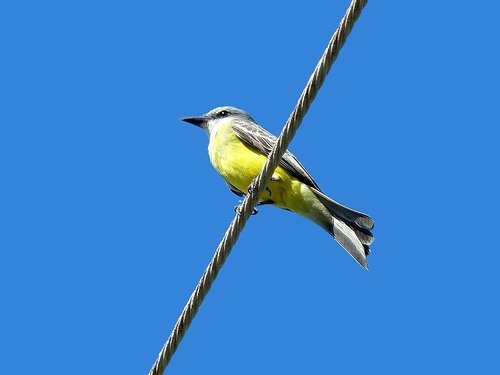 These large flycatchers are one of the most widespread birds of the American tropics, reportedly thought to be increasing as forest is cleared. Here is a shot of one on a typical perch. 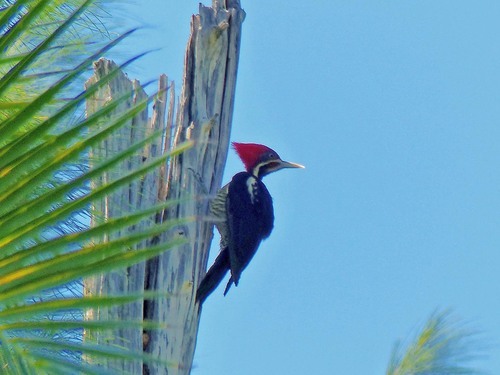 There we also found several Yucatan Woodpeckers. Here is a shot of one at the top of an electricity pylon. The street lamps were also a great attraction to these birds. They used the metal lamp hood for drumming as the sound reverberated. As to raptors, an Osprey was seen flying around the coast at Costa Maya with a group of a dozen Magnificent Frigatebirds and a few Royal Terns as we disembarked the ship. Victor then took us into the interior to see a Roadside Hawk sitting patiently in a tree (but too far away for a decent photo) and on the way back, we spotted a Laughing Falcon sitting on a telegraph post by the side of the road. Whereas the hawk will eat most anything it can catch, the falcon is a specialist snake-eater. It gets its name from its call which apparently resembles a human laugh. Finally we spotted this Common Black Hawk, a buteo family member like our Buzzard, and perched in a dead tree by the roadside. 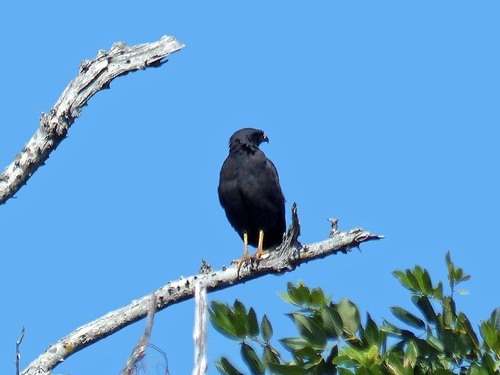 A bird of the mangrove swamps in the Yucatan, it prefers to feed on reptiles, crustaceans (especially crabs) and fish – even paddling in the water to disturb prey. Finally on the Yucatan, with Victor we visited a group of half dried-out ponds – to see a Roseate Spoonbill, two Gray-necked Woodrails (hiding) and a pair of Belted Kingfishers. 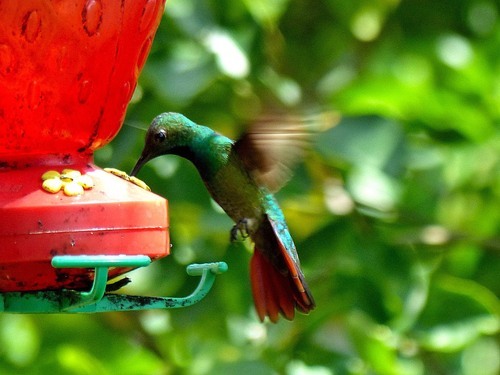 As to Cozumel, here the highlight was undoubtedly the hummingbirds. First, our guide Arturo showed us this tiny female Green-breasted Mango sitting on its eggcup nest woven with spiders’ webs. Then he took us to see the adults sipping “nectar” from the artificial dispensers in a garden in El Cedral. Here is a male showing off his long bill, red tail feathers and metallic colours. We were so close that you could hear the wings buzzing. Besides the Mangos, an even smaller endemic Cozumel Emerald appeared and buzzed round our heads as it inspected the threat! Satisfied, it also took a drink. No doubt because of the extensive mangroves on the island, we saw a further good variety of birds on Cozumel, including Vaux’s Swifts (much smaller than our Common Swift), a pair of Least Grebes (similar to our Little Grebe), Banaquits, a Northern Jacana, the endemic Black Catbirds, the endemic Yucatan Vireo, the endemic Cozumel Vireo, the endemic Yucatan Flycatcher, White-crowned Pigeons, diminutive Ruddy Ground-doves, a White-winged Dove, and several types of warbler. 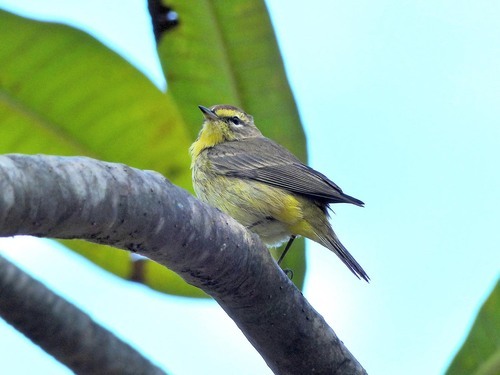 Here is a photo of the pretty chestnut-crowned Palm Warbler which I took a day earlier in the main square in Havana. This species seems to be bolder than most of its family relatives. The birds seemed unfazed by humans in both central Havana and earlier in Key West. 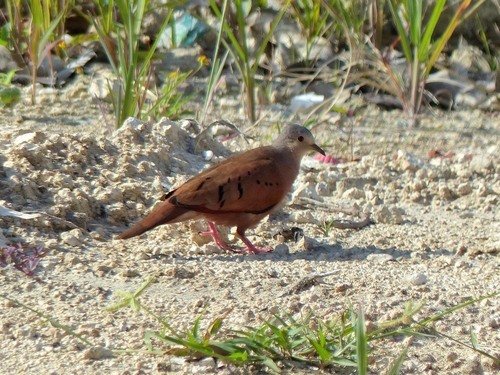 And here is a male Ruddy Ground-dove foraging on the ground. The White-winged Dove perched in a tree was not so readily photographed. So here is a close-up of the same bird that I took in Costa Rica earlier. 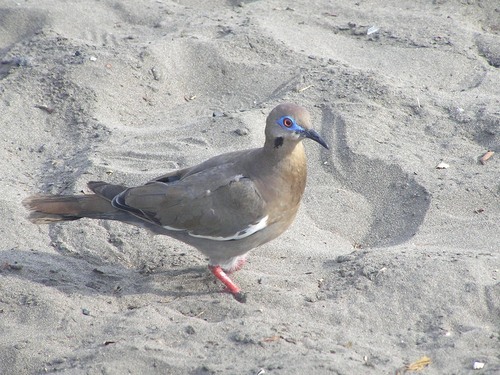 Note the unusual blue featherless skin patch around the eye and the white wing bar which gives the bird its name. Like the Collared Dove, this species has been a very successful coloniser, now having spread even into Canada. 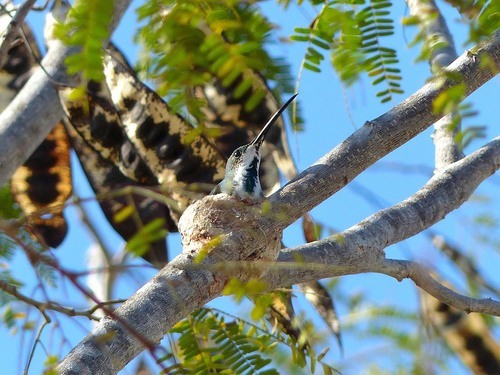 Some birds reportedly migrate down into Central America for the winter- an intelligent bird!. Here are my Cozumel shots of two endemics from the Yucatan. 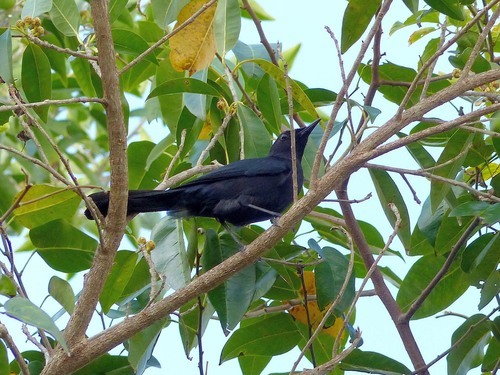 The Black Catbird, though it looks very similar to our Blackbird (but without the yellow beak), is actually from the New World "mimid" family (that includes Mockingbirds and Thrashers), so called for their vocalisation mimic abilities. It apparently gets its name from catlike whiskers, though they are not very evident, unlike on its relative, the much commoner Grey Catbird. I was lucky to see it, as it likes undergrowth and is red-listed due to habitat loss and declining numbers (estimated total population 50,000). 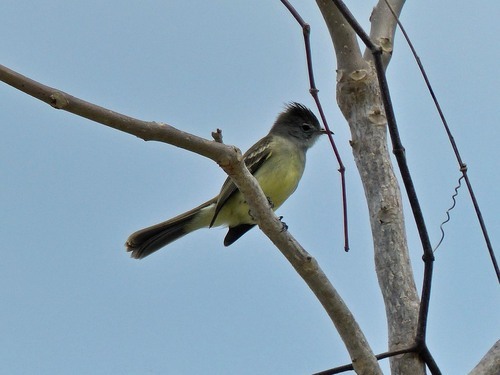 In contrast, the Yucatan Flycatcher (least concern) is a typical flycatcher, liking high open perches. In particular I like the punk crest on this species. Virtually everywhere we went on our cruise we would see Turkey and/or American Black Vultures circling in the sky, often quite low as they smell out, or look for, carrion, their almost exclusive diet. The Yucatan was no exception. 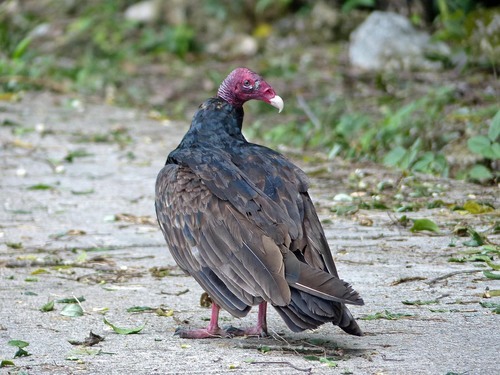 The Turkey Vulture is an impressively large bird. So despite its ugly looks, as a final image I have to include this close-up I took when an individual landed close by on a Cozumel golf course. Note in particular the perforated nostrils that give the bird such a great sense of smell. But I didn’t get too close as their prime defence mechanism is to regurgitate foul-smelling semi-digested food over anything that it perceives as a threat!